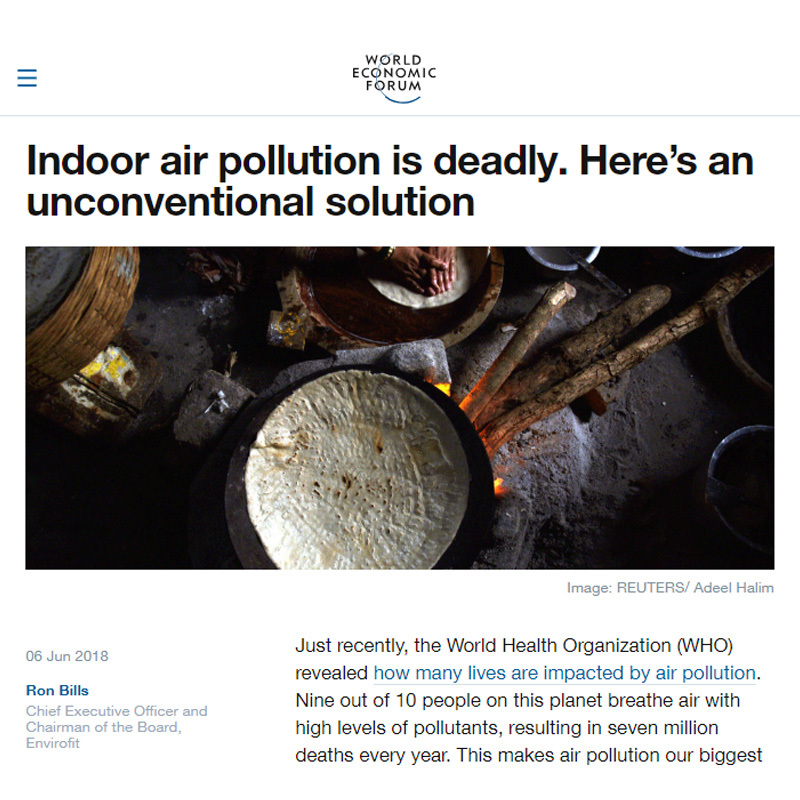 This article written by Ron Bills – Envirofit International CEO & Chairman of the Board – for The World Economic Forum on their blog, Agenda. Just recently, the World Health Organization (WHO) revealed how many lives are impacted by air pollution. Nine out of 10 people on this planet breathe air with high levels of pollutants, resulting in seven million deaths every year. This makes air pollution our biggest environmental health risk. As the world continues to urbanize, emergent middle-class populations in China, India and elsewhere are putting new strains on our global energy resources. Easy access to energy is often the measuring stick for societal advancement. Images of smoggy cityscapes with dramatically obscured skylines offer telling visual proof of the numbers reported by the WHO. Though outdoor (ambient) air pollution is a serious issue, more than half of deaths caused were the result of household air pollution (HAP). Though HAP receives less attention than ambient air pollution, it causes more deaths than HIV, malaria and TB combined. Worldwide, three billion people lack access to modern cooking fuels such as electricity and liquified petroleum gas (LPG). Instead, they cook with biomass fuels such as wood, charcoal, dung or crop waste, over smoky fires and inefficient stoves. This is often done inside the home, and it wastes 90% of the fuel’s energy. HAP is the noxious combination of smoke, particulate matter and other emissions from this solid fuel combustion. These common cooking practices are resource-intensive and highly dangerous. They are the leading cause of global exposure to HAP, and disproportionately affect women and children.